Spinal Decompression Fayetteville, Farmington, Springdale, AR Chiropractor & Physical Therapy : Wellness Professionals, Inc.
Non-Surgical Spinal Decompression can be used to treat a wide variety of conditions such as chronic headaches or neck pain, back pain, leg pain, sciatica and even bulging, herniated or degenerative discs. 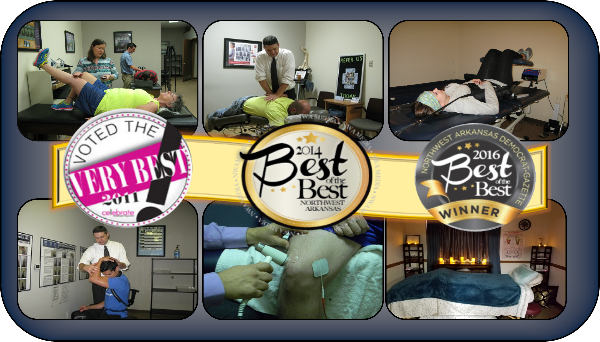 If you have been suffering with any of these conditions and are looking for a non-invasive and long-lasting treatment option, decompression may be the answer for you. Non-Surgical Decompression utilizes a motorized traction machine to provide safe and effective treatment without the usual risks associated with invasive procedures such as injections, anesthesia or surgery. 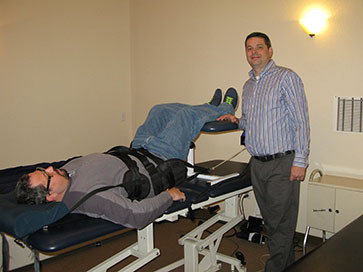 Spinal decompression works through a series of alternating decompression and relaxation cycles programmed to give the most relief to the condition being treated. During the decompression phase gentle resistance is applied to the spine and the pressure in the disc is reduced. This allows the disc, the gel- like cushions between the vertebra, to receive nutrients and promote healing. In the case of herniated or bulging discs this treatment may help the discs to retract, relieving the nerve pain caused by the stress of the discs pressing on nerve roots. Now that you know, what have you got to lose? Imagine living with less pain and more mobility. If this sounds good to you, call our office at (479) 444-9449 for a FREE CONSULTATION with Dr. Dickerson to learn more about Non-Surgical Spinal Decompression!